Hazel Hall Nursing Home is purpose built, and set in its own secure grounds with car parking facilities and is monitored by CCTV. It contains 45 bedrooms (44 private and 1 semi-private rooms). Each room is equipped with Cable TV (Flat Screen) and call bell system. On entering Hazel Hall Nursing Home, reception and the office of the Registered Provider is to the right and the clinical treatment room is to the left. Straight ahead is a seated lobby area which opens onto a central courtyard garden. 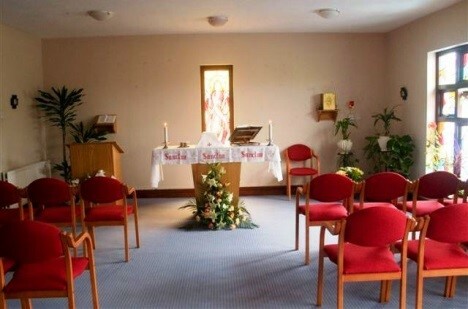 To the right of the lobby is a nurses’ station, the office of the Person in Charge and multi-denominational chapel. To the left of the lobby, there is a large day room which overlooks and has access to the central courtyard garden. Next to the day room is a toilet and hairdressing salon. Across from this is the dining room for residents and staff, kitchen and doors accessing the external stores. The Abbey Suite contains 1 twin and 13 single bedrooms. It contains a bright and spacious recreation and dining area which overlooks and provides free-roaming access to a multi-sensory garden. The Abbey Suite also contains two assistive bathrooms, one separate toilet and staff toilet, wash hand basin, showering/changing facilities, a sluice room and linen storage room. The Liffey Suite contains 16 single en-suite bedrooms and a main bathroom with assistive shower and bath facilities. Externally, at the point where the Liffey Suite meets the Moate Suite, there is a smoking area for residents who wish to smoke. The Moate Suite contains 13 single bedrooms of which 7 bedrooms contain en-suite toilet and wash hand basin facilities. There is an assistive bathroom, an additional toilet and shower room, a staff toilet and a sluice room. Externally, there are administration offices and food storage for dry and refrigerated food products. Further to this, there is additional storage space for chemical and sanitary supplies. There is a boiler house, generator house and maintenance officers’ workshops. Security measures are implemented through safety barrier and CCTV surveillance. Ample car parking is available to the front of Hazel Hall Nursing Home and this is monitored by CCTV. There is a clearly defined evacuation assembly point to the front of the nursing home. All access/egress points are electronically monitored and controlled and are fitted with a keypad locking system. The front door is securely closed at all times and is accessed/egressed by an intercom and lock release system which is controlled by staff. Access to/from the Abbey Suite is via keypad locking system which is monitored by staff.